World record holder Michael Frater of Jamaica to race at Central Park. Two of the world’s fastest men will race at the 2012 Australia Post Stawell Gift this Easter, with 4x100m relay world record holder Michael Frater of Jamaica now set to join 2003 world 100m champion Kim Collins in the chase for the $40,000 winner’s cheque. An integral member of the all-conquering Jamaican relay team, Frater combined with teammates Nesta Carter, Yohan Blake and Usain Bolt to sensationally win gold in a world record time of 37.04 seconds at last year’s world championships in Daegu, Korea. Team Jamaica boasts the top three relay performances of all-time – and Frater has featured in all three. The 29-year-old stormed to relay gold at the 2008 Olympics in Beijing (37.10sec) and secured his first world championship relay title (37.31sec) in Berlin in 2009. His individual 100m resume is just as impressive. In 2005, Frater was awarded silver at the world championships after a photo-finish with a resurgent Collins, both athletes clocking 10.05 seconds. On six occasions Frater has stopped the clock under the ten second mark for the 100m, and just last year he powered to a new personal best of 9.88sec at the Lausanne IAAF Diamond League meet. With Jamaican sprint stocks at all time high, Frater will look to Stawell as a key part of his Olympic Games preparation. “The year ahead is a big one for me obviously with the main focus on the Olympics in August but first I need to get through my country’s trials,” said Frater, who placed sixth in the 100m final in Beijing 2008. Having spent many years training on grass in Jamaica, Frater may just have a few tricks up his sleeve when he graces the hallowed turf at Central Park. “I am very excited to run at the Stawell Gift,” Frater said. “It’s a race that I have read about for years and it seems to be a great event with a lot of history. “I believe that running on grass will work in my favour. Being from Jamaica, I have grown up running on grass tracks and every year the majority of my training is done on grass. Frater is a long term member of the famous MVP Track Club in Jamaica, which is headed by coach Stephen Francis and boasts the calibre of former world 100m record holder Asafa Powell and reigning Olympic 100m champion Shelley-Ann Fraser. Hailing from a talented sporting family, his mother Monica was a sprinter, his father Lyndell a cricketer and his older brother Lindel competed at the Sydney 2000 Olympic Games where he reached the semi-finals of the men’s 100m. “This year’s Australia Post Stawell Gift will feature a strong Caribbean flavour, and sports fans are in for a treat with pocket rockets Kim Collins and Michael Frater in action this Easter,” said Australia Post Stawell Gift promoter David Culbert. The 131st edition of the Australia Post Stawell Gift carnival will be staged over the Easter long weekend from Friday, 6 April to Monday, 9 April 2012. The carnival kicks off with the Calcutta on Friday night and is followed by three days of thrilling racing, including the Driscoll McIllree and Dickinson Ladies Day and Family Day, all culminating in the 131st running of the Australia Post Stawell Gift on Easter Monday. For those still looking for accommodation at Easter, check out Stawell Central, a temporary accommodation precinct located just minutes from Central Park. Further information can be found on www.stawellgift.com. JAMAICAN Michael Frater, one of the fastest men on the planet and Usain Bolt's relay partner, will run at the Stawell Gift. In a coup for Australia's richest footrace, Frater - who has a personal best of 9.88sec for the 100m - is using the Easter event to prepare for Jamaica's Olympic trials. Team Jamaica boasts the top three 4x100m relay performances ever and Frater and Bolt are the only runners to feature in all three. Frater ran the second leg last year at the world championships in Daegu, South Korea, where Jamaica - with Bolt, Nesta Carter and new world champion Yohan Blake - won the gold in a world record 37.04sec. They ran a then world and Olympic record at the 2008 Beijing Olympics (37.10) and also took the world title at the 2009 world championships in Berlin (37.31). Frater, 29, has an impressive resume, having won the 100m silver medal at the 2005 world championships. He grabbed second in a photo-finish in that race from fellow Caribbean sprinter Kim Collins, against whom he will race in Stawell. Collins, third at last year's world championships, was run-out in the semi-finals of the Gift last year, but he confirmed this week he would be returning to Stawell. 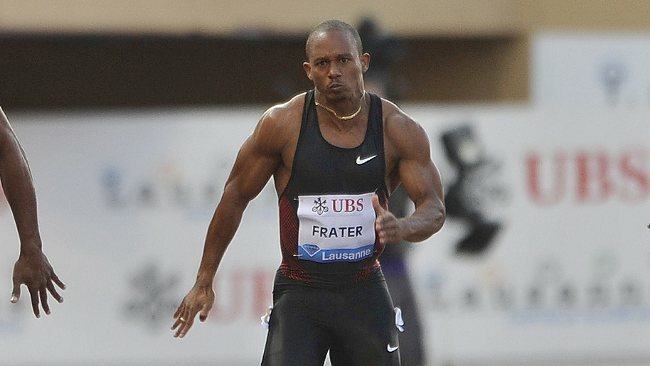 Frater, who set his personal best in Lausanne last year, is a training partner of former world record holder Asafa Powell. He works out regularly on grass tracks in Jamaica and is confident he can adapt to conditions at Central Park in April. "I believe that running on the grass will work in my favour," Frater said. "Being from Jamaica, I have grown up running on grass tracks and every year the majority of my training is on grass. "I'm very excited to run at the Stawell Gift as it's a race ... with a lot of history." He said the hype was already building in Jamaica for the London Olympics. "There is already a lot of buzz in Jamaica about the Games," he said. "Our country is performing at an all-time best. "We have probably close to 10 sprinters who will be breaking 10 seconds for the 100m this year, so it's going to be a very exciting summer." SALLY Pearson will head an Australian team of six to next month's world indoor championships in Istanbul. Pearson will make her first appearance at the event in the 60m and 60m hurdles. Others who will be wearing the green and gold in Istanbul are Craig Mottram (3000m), Dale Stevenson (shot put), Alana Boyd (pole vault), Henry Frayne (triple/long jump) and Ryan Foster (800m).